The comm.CarrierSynchronizer System object™ compensates for carrier frequency and phase offsets in signals that use single-carrier modulation schemes. The carrier synchronizer algorithm is compatible with BPSK, QPSK, OQPSK, 8-PSK, PAM, and rectangular QAM modulation schemes. This System object does not resolve phase ambiguities created by the synchronization algorithm. The Examples demonstrate resolution of phase ambiguity. Create the comm.CarrierSynchronizer object and set its properties. Call the object, as if it were a function. carrSynch = comm.CarrierSynchronizer creates a System object that compensates for carrier frequency offset and phase offset in signals that use single-carrier modulation schemes. carrSynch = comm.CarrierSynchronizer(Name,Value) sets properties using one or more name-value pairs. Enclose each property name in quotes. Modulation type, specified as 'QAM', '8PSK', 'BPSK', 'OQPSK', 'PAM', or 'QPSK'. This System object partially supports CPM. It has been tested for a CPM signal having one sample per symbol and a modulation index of 0.5. Example: comm.CarrierSynchronizer('Modulation','QPSK') creates a carrier synchronizer System object to use with a QPSK modulated signal. Modulation phase offset method, specified as 'Auto' or 'Custom'. 'Auto' — Apply the traditional offset for the specified modulation type. 'Custom' — Specify a user-defined phase offset with the CustomPhaseOffset property. Custom phase offset in radians, specified as a scalar. This property applies when the ModulationPhaseOffset property is set to 'Custom'. Number of samples per symbol, specified as a positive integer. Damping factor of the loop, specified as a positive scalar. Normalized bandwidth of the loop, specified as a scalar in the range (0,1]. The loop bandwidth is normalized by the sample rate of the synchronizer. Decreasing the loop bandwidth reduces the synchronizer convergence time but also reduces the pull-in range of the synchronizer. [outSig,phErr] = carrSynch(inSig) compensates for frequency offset and phase offset in the input signal. This System object returns a compensated output signal and an estimate of the phase error. Input signal, specified as a complex scalar or a column vector of complex values. Output signal, returned as a scalar or column vector with the same data type and length as inSig. The output signal adjusts the input signal compensating for carrier frequency and phase offsets in signals that use single-carrier modulation schemes. Phase error estimate in radians, returned as a scalar or column vector with the same length as inSig. Correct phase and frequency offsets of a QPSK signal passed through an AWGN channel. Using preambles, resolve phase ambiguity. Add preambles to each frame, which are used later when performing phase ambiguity resolution. Generate random data symbols, and apply QPSK modulation. Create a comm.PhaseFrequencyOffset System object™ to introduce phase and frequency offsets to the modulated input signal. Set the phase offset to 45 degrees, frequency offset to 1 kHz, and sample rate to 10 kHz. The frequency offset is set to 1% of the sample rate. Create a carrier synchronizer System object to use for correcting the phase and frequency offsets with samples per symbol set to 1. Apply phase and frequency offsets using the pfo System object, and then pass the signal through an AWGN channel to add white Gaussian noise. Display the scatter plot of the received signal. 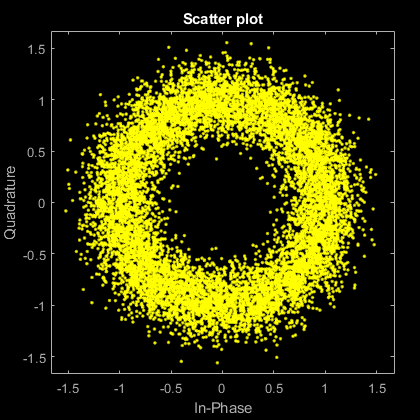 The data appear in a circle instead of being grouped around the reference constellation points due to the frequency offset. Use the carrierSync System object to correct the phase and frequency offset in the received signal. Use a constellation diagram to display the first and last 1000 symbols of the synchronized signal. 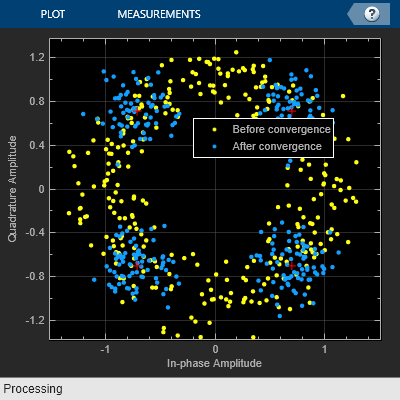 Before convergence of the synchronizer loop, the plotted symbols are not grouped around the reference constellation points. After convergence, the plotted symbols are grouped around the reference constellation points. Demodulate the synchronized signal. Compute and display the total bit errors and BER. Phase ambiguity in the received signal might cause bit errors. Using the preamble, determine phase ambiguity. Remove this phase ambiguity from the synchronized signal to reduce bit errors. Demodulate the signal after resolving the phase ambiguity. Recompute and display the updated total bit errors and BER. Removing the phase ambiguity reduces the BER dramatically. Estimate the frequency offset introduced into a noisy 8-PSK signal using a carrier synchronizer System object™. Create a comm.PhaseFrequencyOffset System object to introduce phase and frequency offsets to a modulated signal. Create a carrier synchronizer System object to use for correcting the phase and frequency offsets. Set the Modulation property to 8PSK. Generate random data and apply 8-PSK modulation. Apply phase and frequency offsets using the pfo System object, and pass the signal through an AWGN channel to add Gaussian white noise. Use the carrier synchronizer to estimate the phase offset of the received signal. Determine the frequency offset by using the diff function to compute an approximate derivative of the phase error. The derivative must be scaled by 2π because the phase error is measured in radians. Plot the running mean of the estimated frequency offset. After the synchronizer converges to a solution, the mean value of the estimate is approximately equal to the input frequency offset value of 1000 Hz. Compensation of significant phase and frequency offsets for a 16-QAM signal in an AWGN channel is accomplished in two steps. First, correct the coarse frequency offset using the estimate provided by the coarse frequency compensator, and then fine-tune the correction using carrier synchronization. Because of the coarse frequency correction, the carrier synchronizer converges quickly even though the normalized bandwidth is set to a low value. Lower normalized bandwidth values enable better correction for small residual carrier offsets. After applying phase and frequency offset corrections to the received signal, resolve phase ambiguity using the preambles. Generate data payloads and add the preamble to each frame. The preamble is later used for phase ambiguity resolution. 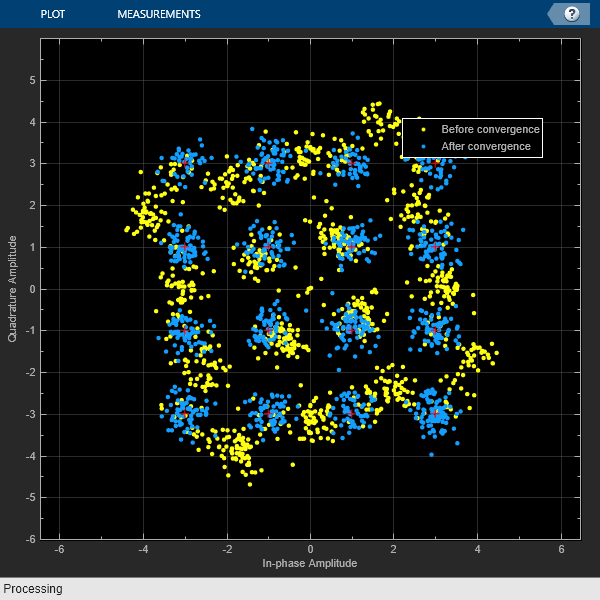 Create a System object for the transmit pulse shape filtering, the receive pulse shape filtering, the QAM coarse frequency compensation, the carrier synchronization, and a constellation diagram. Also create a System object for the AWGN channel, and the phase and frequency offset to add impairments to the signal. A phase offset greater than 90 degrees is added to induce a phase ambiguity that results in a constellation quadrant shift. Generate random data symbols, apply 16-QAM modulation, and pass the modulated signal through the transmit pulse shaping filter. The coarse frequency compensator System object provides a rough correction for the frequency offset. For the conditions in this example, correcting the frequency offset of the received signal correction to within 10 Hz of the transmitted signal is sufficient. Pass the signal through the receive pulse shaping filter, and apply fine frequency correction. Display the constellation diagram of the first and last 1000 symbols in the signal. Before convergence of the synchronization loop, the spiral nature of the diagram indicates that the frequency offset is not corrected. After the carrier synchronizer has converged to a solution, the symbols are aligned with the reference constellation. Demodulate the signal. Account for the signal delay caused by the transmit and receive filters to align the received data with the transmitted data. Compute and display the total bit errors and BER. When checking the bit errors, use the later portion of the received signal to be sure the synchronization loop has converged. Depending on the random data used, there may be bit errors resulting from phase ambiguity in the received signal after the synchronization loop converges and locks. In this case, you can use the preamble to determine and then remove the phase ambiguity from the synchronized signal to reduce bit errors. If phase ambiguity is minimal, the number of bit errors may be unchanged. Demodulate the signal after resolving the phase ambiguity. Recompute the total bit errors and BER. Model channel impairments such as timing phase offset, carrier frequency offset, and carrier phase offset for a minimum shift keying (MSK) signal. Use comm.MSKTimingSynchronizer and comm.CarrierSynchronizer System objects to synchronize such signals at the receiver. The MSK timing synchronizer recovers the timing offset, while a carrier synchronizer recovers the carrier frequency and phase offsets. Initialize system variables by running the MATLAB script configureMSKSignalRecoveryEx. Define the logical control variable recoverTimingPhase to enable timing phase recovery, and recoverCarrier to enable carrier frequency and phase recovery. Specify the sample delay, timingOffset, that the channel model applies. Create a variable fractional delay object to introduce the timing delay to the transmitted signal. Create a comm.PhaseFrequencyOffset System object to introduce carrier phase and frequency offsets to a modulated signal. Because the MSK modulator upsamples the transmitted symbols, set the SampleRate property to the ratio of the samplesPerSymbol and the sample time, Ts. Create a comm.AWGNChannel System object to add white Gaussian noise to the modulated signal. The noise power is determined by the EbNo property, that is the bit energy to noise power spectral density ratio. Because the MSK modulator generates symbols with 1 Watt of power, set the signal power property of the AWGN channel System object to 1. Create an MSK timing synchronizer to recover symbol timing phase using a fourth-order nonlinearity method. Create a carrier synchronizer to recover both carrier frequency and phase. 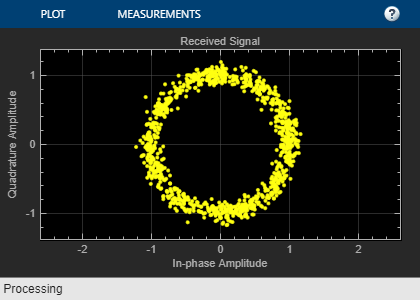 Because the MSK constellation is QPSK with a 0-degree phase offset, set the comm.CarrierSynchronizer accordingly. 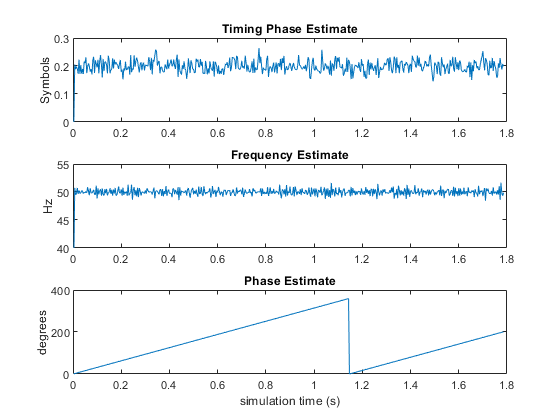 At the end of the simulation, the example displays the timing phase, frequency, and phase estimates as a function of simulation time. Display the bit error rate and the total number of symbols processed by the error rate calculator. 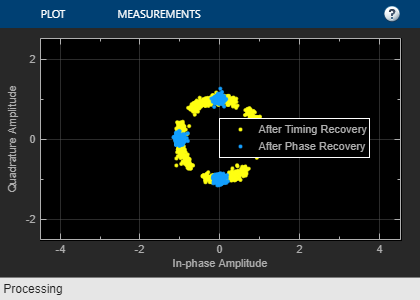 The recovery algorithms are demonstrated by using constellation plots taken after timing, carrier frequency, and carrier phase synchronization. Open the script to create a writable copy of this example and its supporting files. Then, to show the effects of the recovery algorithms, you can enable and disable the logical control variables recoverTimingPhase and recoverCarrier and rerun the simulation. where λn is the output of the direct digital synthesizer (DDS). The DDS is the discrete-time version of a voltage-controlled oscillator and is a core component of discrete-time phase locked loops. In the context of this System object, the DDS works as an integration filter. To correct for the frequency offset, first the algorithm determines the phase error, en. The value of the phase error depends on the modulation scheme. For a detailed description of this equation, see . where Bn is the normalized loop bandwidth, and ζ is the damping factor. 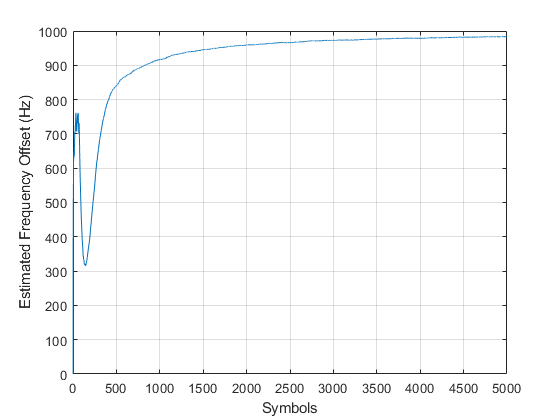 The phase recovery gain, K0, is equal to the number of samples per symbol. The modulation type determines the phase error detector gain, Kp. The expression for (Δf )pull-in becomes less accurate as 2π2ζBn approaches 1. Rice, M. Digital Communications: A Discrete-Time Approach. Upper Saddle River, NJ: Prentice Hall, 2009, pp. 359–393. Zhijie, H., Y. Zhiqiang, Z. Ming, and W. Kuang. “8PSK Demodulation for New Generation DVB-S2.” 2004 International Conference on Communications, Circuits and Systems. Vol. 2, 2004, pp. 1447–1450.